This Is Drivel » Blog Archive » Books! Ive never read anything by Norman Mailer before. This is one hell of a way to start. Ive picked up Of A Fire On The Moon at least twice, once when I was in high school and again when I was in college, but I wasnt ready for Norman Mailer then; Im not sure I was ready this time, but his novelization of the Apollo 11 moon landing has become part of the canon of moon landing lore, so it became a part of my permanent collection. When I got to feeling as though I needed another infusion of moon lore, I cast my eye on my books to be read, thinking, I need something that puts a different slant on the story this time, and man, I got it. Mailer inserted himself into the story, called himself Aquarius, and tried to write about it as if he could somehow render it more dramatic than it already was. The astronauts and the technicians at Nasa bugged the hell out of him with their teamwork mentality and their inability to speak in anything but dry, clipped technospeak, but they were engineers, all of them, and so focused on their goal that most of them slept, when they slept at all, on cots in their offices and breakfasted on coffee and cigarettes. Of course their words were dry and clipped. Mailer wanted them to be poets or, at least, a bit more lyrical. More like him, I would guess. If men were going to all the trouble to walk on the moon, he wanted them to be able to bring that experience back to the people they kept insisting they were doing it all for, the People of Earth, not at all an unreasonable request, but not possible in that day and age when they had to cobble together a lander that was so technologically complicated it had to be flown by not one, but two total engineering geeks. Poetry was not their strong suit. I didnt care much to read the details of Mailers life, inserted into the frame of the story, and the age of Aquarius stuff didnt do much for me in setting the tumultuous stage the rest of the nation was playing on. 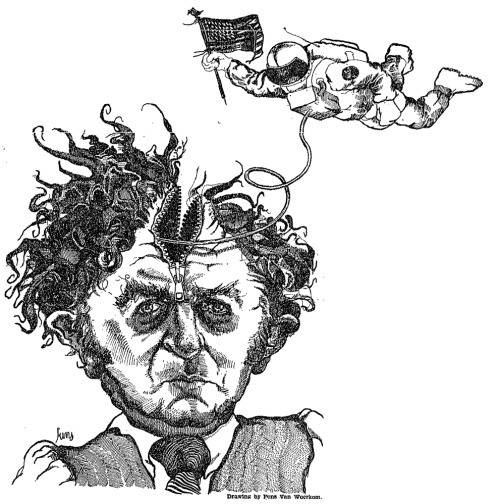 It was distracting and seemed dated: When hes not describing the moon landing, Mailers descriptions of his mayoral race or his partying seems to drag on like the babble of a self-absorbed beatnik, banging on bongo drums in a run-down coffee house. Still and all, it was indeed a fresh perspective on one of the grandest stories of our country. Ive been reading the stories of William Gibson ever since I read, then re-read, then re-re-read Johnny Mnemonic in the pages of Omni Magazine back in 1981 (I still have the issue, deeply buried somewhere in the archives here at Drivel HQ). His style reminded me of Michael Herrs Dispatches, a tattered copy of which I kept in a jacket pocket and read snatches from as compulsively as youd pick at a scab, (I meant that to be a compliment. I hope hed take it that way) and did the same with Gibson, too, after I discovered him. Gibsons prose combines stream of thought with a relentless hyperawareness of his surroundings, but with an artists control so that his observations dont come tumbling out like the cataracts of a class five whitewater river. The result is a body of work that describes the world around his characters with the same attention he gives to their thoughts, motives and appearance. Everything in Gibsons stories comes alive. Richard Dawkins has a way of explaining things that seems to piss a lot of people off. Although Im not in that camp of people, I can see why. He writes out most thoughts with such finality that they sound almost as if hes issuing decrees from on high. That may be his purpose, now that I think of it, to put him in the same league with the anti-evolutionists he argues against. For quite a while I avoided books like this, thinking, Whats the point? It doesnt change the mind of anyone who doesnt believe in evolution. But that doesnt appear to be the point of this book. Its more to the point of filling in the gaps in my own knowledge of evolution, and strengthening knowledge is never a bad thing, whether youre for or against a topic as contentious as this one.